A year or more ago, I posted about a movie called "King Corn". It was a study done by some young men who followed their families' histories to the heartland of our country, their combined backgrounds with the corn industry, their curiosity about how corn is grown and how far the final crops branch out into our society. It was quite fascinating. I was upset to learn what many of you may have already known: cattle are not meant to eat corn, and if they weren't sent to slaughter when they are, their ulcerated stomachs would kill them anyway. I found this so particularly disgusting I vowed to find a source for grass fed beef even if it meant eating less beef than I'd like (and I am a lover of good beef). I was fortunate enough to find a ranch in southern Colorado, outside Durango, that grazes long horns in the national forests all summer and finishes them off on brewer's mash before slaughtering for their private market. 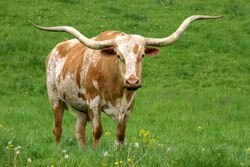 Their brochure includes lots of information about how longhorns have a lower body fat percentage than regular cattle, and comparisons of their ranch's beef to the health benefits normally thought to come only from poultry or fish. If all of that wasn't wonderful enough, the taste of this meat is so amazing, we are now hooked. Then, last night, my friend Sarah posted this information on grass fed beef on her Facebook page: 10 Reasons Not to Give Up Red Meat. It's about the many health benefits of eating grass fed beef. Imagine that! I know it's not easy for everyone to access grass fed beef, or it may be too expensive if you do...but I felt this needed to be shared. Caveat emptor, as I learned in that business law class all those decades ago...and shame on us if we're not paying attention while others are trying to poison us. Thanks Martie. I think we all need to be more informed and responsible about our food choices and where it comes from. That's why I like being a deer hunter and having control over the meat that's going into my freezer and my mouth. Martie: I do like the grass fed approach. Good for all concerned. Our cattle were (are) fed a grain supplement that did not have corn. The cattle grazed on native grasses and when I shipped them, they had put on good weight, looked good, and were healthy all the way around. We raised Angus. The longhorn genetics is so very good to be cross-bred into just about any beef stock. Marvelous post you have here. We watched "King Corn" based on your first recommendation of the movie. The treatment of cows is disgusting. I was just as disturbed by government actions that have lead to corn syrup being found in so many food products where it's not necessary. The health implications are enormous. Thanks for another thought provoking post! Locally, its getting easier and easier to find grass fed beef and even Bison here in Encinitas. And the local Costco has been carrying ground Bison. I love the taste. Thanks for sharing this with us. Interesting post. Wanted to thank you for coming by and wishing me a speedy recovery. I am waiting now for a MRI. I am posting a giveaway tomorrow on my sight for my birthday so please enter.